I have found myself lately eating a handful of almonds as a snack, almond butter (similar to peanut butter) and using almond milk in my smoothies and other recipes. I know almonds are good for me, but specifically what do they have to offer? Almonds are a great source of vitamin E, with 25g providing 70 percent of the recommended daily allowance. They also have good amounts of magnesium, potassium, zinc, iron, fiber and are a good source of healthy monounsaturated fat. They contain more calcium than any other nut which makes them great for vegetarians who do not eat any dairy products. Almonds contain several phytochemicals including beta-sisterol stigmasterol and campesterol which is thought to contribute to a healthy heart. A handful of almonds a day helps reduce the risk of heart disease by lowering LDL, or ‘bad’ blood cholesterol by as much as ten percent. 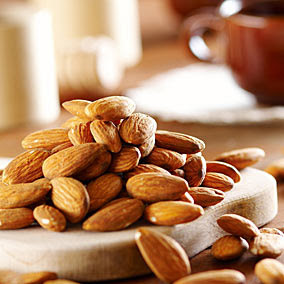 For many years almonds were considered ‘fattening’. However, studies, including the Nurses’ Health Study and the Physicians’ Follow-up Study showed those who ate the most nuts tended to have lower body mass indexes. Although almonds are high in fat and calories, eating them in moderation can actually help with weight loss. One study comparing two groups of dieters eating the same amount of calories found the group eating 500 of their calories from almonds lost more weight. One theory is that almond cell walls may limit the amount of dietary fat available for digestion, or for absorption. Therefore, it is a possibility that a small portion of the calories from almonds may not be completely absorbed by the body. Either way, replacing a given amount of calories in the diet with almonds will not equal the same in weight gain. As almonds are high in protein, around 18 percent, and contain virtually no carbohydrates, they are ideal for diabetics, pre-diabetics or anyone with blood sugar issues. Almonds are so versatile too! I made pesto with almonds the other day... Love them! Almond meal substituted for part of the flour in chocolate chip cookie recipes or pancakes is divine.